It’s that time of year again. Not quite mud season. Worse. The piles of snow left on the ground have guaranteed this late winter phenomenon – thaw, puddle, refreeze, ice. It wreaks havoc with sidewalks, creating skating rinks overnight. It makes ski trails into luge runs in the morning, and slush in the afternoons. This in-between season has forced me to modify my outdoor activities. A creature of habit, I too often get in a rut, reluctant to vary my routine. But Mother Nature is showing me that change has its rewards. 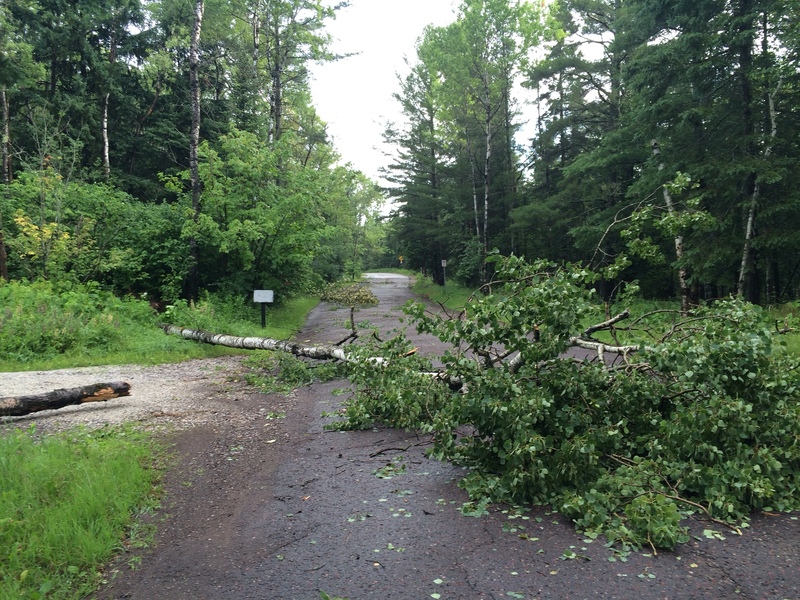 A hike on the Lester River Trail proved to be a viable option last week. I found that rather than focusing on a workout on my skis, I could just meander and take in the snowy sights in the very same woods. The trails were firmly packed by fat tire bikes and foot traffic, making travel easy. It was an entirely different experience. I was far more attuned to my surroundings. 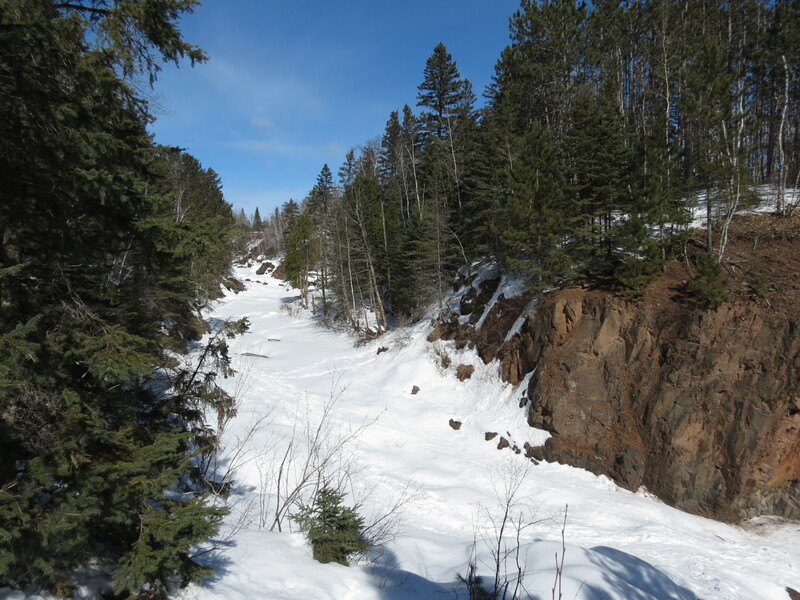 At the Lester River overlooks, I wondered if I might have snowshoed up the riverbed. But the sound of flowing water and open spots in the ice told me otherwise. I was content to admire and follow my beaten path. All was quiet on that weekday afternoon, making it a most peaceful venture. One look at the puddles on the Lakewalk was enough to reroute my morning run. Heading out before dawn, I have moved to the dry pavement of the Scenic Highway shoulders. As a bonus, I have a perfect view of the sunrise over the lake. One day a deep red line glows across the horizon. The next a pale orange hue hangs above the low clouds. The sun’s rays skitter across the lake. By the time I turn around to head home, the low sun illuminates the snowy mounds that line the lakeshore. Adjacent to the deep blue water, the face of the snowbanks reflects the sunlight. The backsides are bluey shadows. It’s a color pattern that never grows old. I watch it for miles. Reaching via Brighton Beach, I find a new scene every day. Over the weekend when the wind was calm, the water’s surface froze into a fine mirror. Its thin veneer perfectly reflected the rocks, snow and ice. The picture of calm. I returned later in the day to see what sculptures the wind had made with the fragile ice. Sure enough, ice shards lay stacked in random fashion on the shore, glinting in the sunlight. As I walked the shore to take in Nature’s art work, I kept hearing an eerie whining sound. I turned to see rocks skidding across the surface of the ice, as if they were miniature curling stones. The resulting harmonics emanated from the rocks, changing pitch as they slowed and then stopped. I wondered how the responsible adults figured out this musical phenomenon. I don’t know what possessed these young men to ride their fat tire bikes off the ice bergs to plunge into Lake Superior, but it was enough to stop me mid-run to watch. (To see Rich’s video, click here.) I may have found new ways to enjoy the outdoors this season, but I will stop short of trying this one. Sometimes it’s worth conceding to Mother Nature. Life is a lot more pleasant if you work with her, rather than trying to bend her will to suit a preconceived plan. Fortunately, I figured that out this week. That plan was to cycle the Paul Bunyon Trail and do some hiking in the Walker area with my friend Myra. But two solid days of rain in the forecast were enough to put us off. We cancelled our motel reservation and instead took advantage of sunny days later in the week for some superb local cycling. 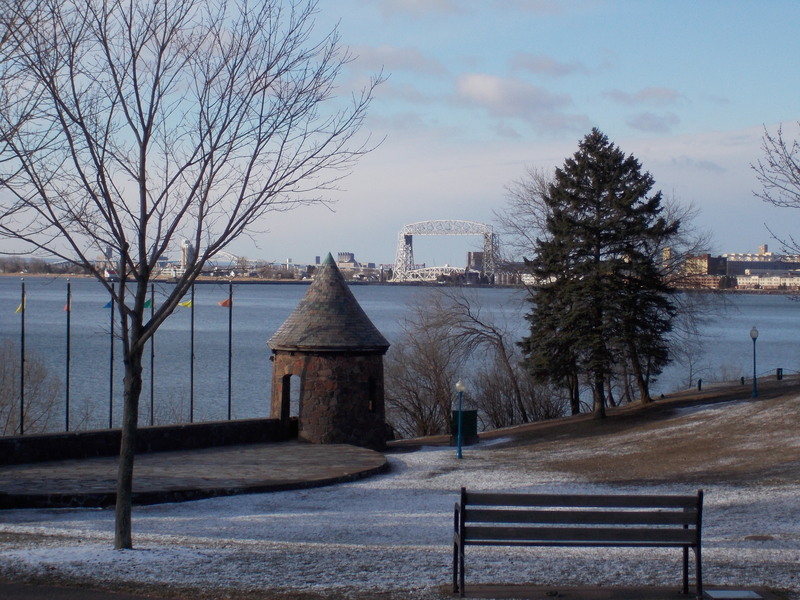 Our first outing took us across Duluth from end to end, traveling the full length of Skyline Parkway. 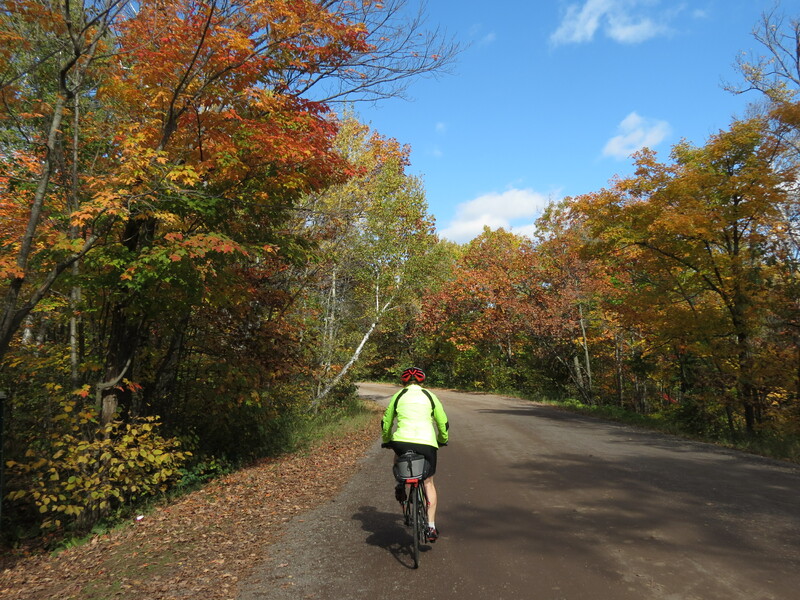 There was a definite chill in the air as we stretched our route by cycling inland to Pike Lake before heading to the far western end of the parkway. 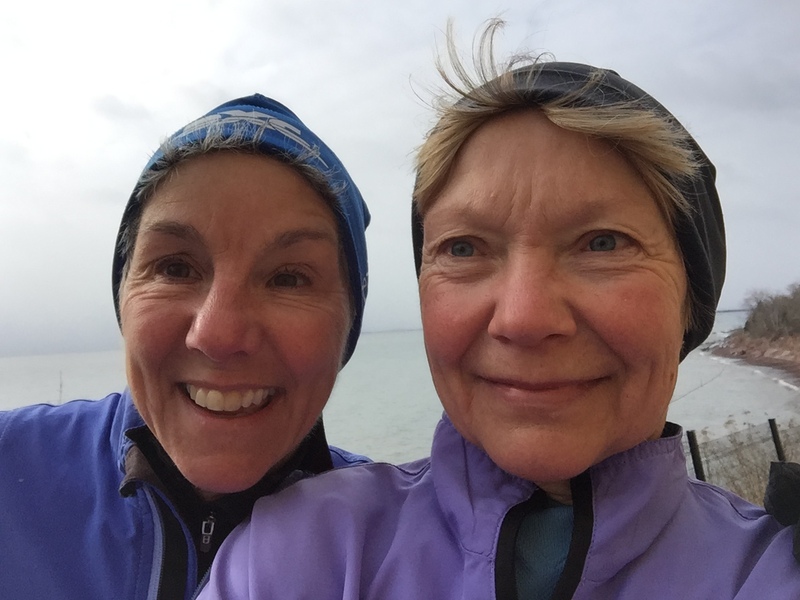 We soon lost our fingers and toes to the frigid conditions, pressing into a brutal headwind. But it still beat rain. A warm-up with hot drinks at the Red Goose Coffee Shop restored feeling to our extremities and a change in direction eased the curse of the wind, boosting our spirits. From our perch high above the city, we had full view of the harbor below. Despite the deep blue sky, the water was a distinct brown – no doubt the result of the runoff from the previous two days of heavy rain. The nascent fall colors were far from peak, but isolated trees of brilliant hues punctuated the landscape. At Skyline’s opposite end, we traveled along Hawk Ridge. Flanked by birders peering through their binoculars, we took in the limitless view. There Lake Superior shone in its full blue glory. From our elevated perch it was a fast descent home down Seven Bridges Road, hardly requiring a single push on our pedals to complete our 50 mile ride. Pausing for a gloomy day, we mounted our bikes again two days later. 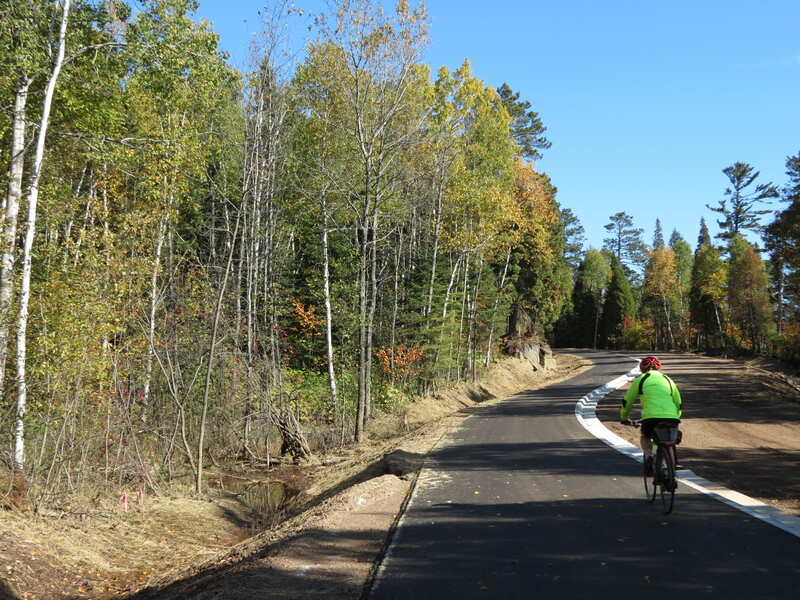 This time we chose the Gitchi-Gami State Trail along the North Shore from Gooseberry Falls to Silver Bay. Taking advantage of the longest stretch of completed trail, we cycled out and back to double the enjoyment of its pleasures. 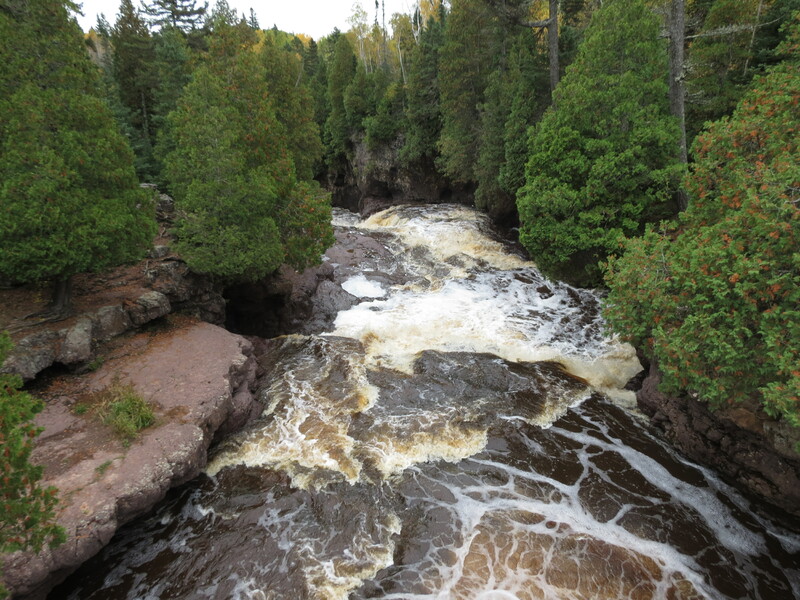 It was quite a surprise to see water spouting out from the spring waterfall in the cliffs north of Gooseberry Falls. Its unseasonal appearance was yet more evidence of the recent wet conditions. 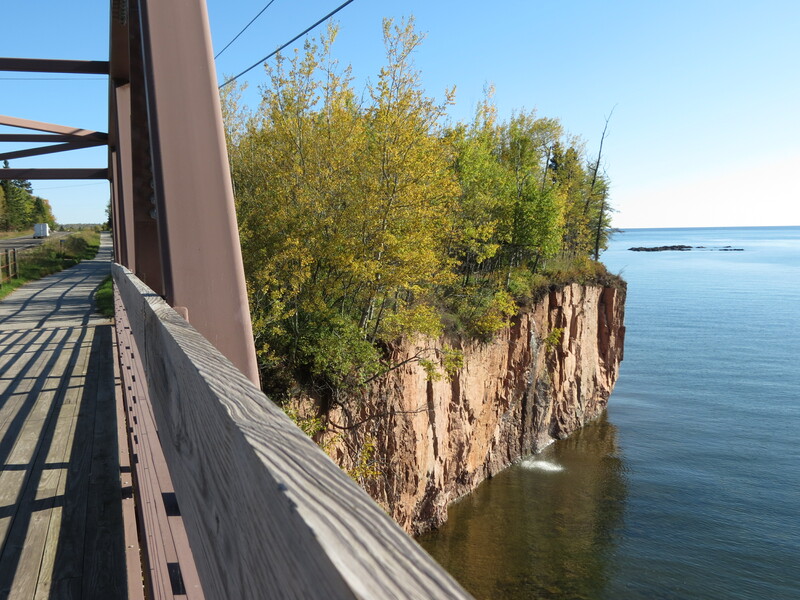 I remembered the trail’s hilly dalliance through Split Rock Lighthouse State Park, as it wound down toward the water and back up again through the woods. But I was surprised at just how much it undulated throughout the distance of our ride. We actually preferred that to the flat sameness of the rails-to-trails cycle routes. At Beaver Bay, we pioneered a brand new section of the Gitchi-Gumi trail. Spying pristine new blacktop adjacent to road construction still in progress, we took our inaugural ride on a half mile of trail that veered up and inland away from the lake. A half mile later we joined an existing portion of the trail which took us to Silver Bay. We found that orphan bit of older trail rather mystifying, as it has been there for several years but apparently started in the middle of nowhere. 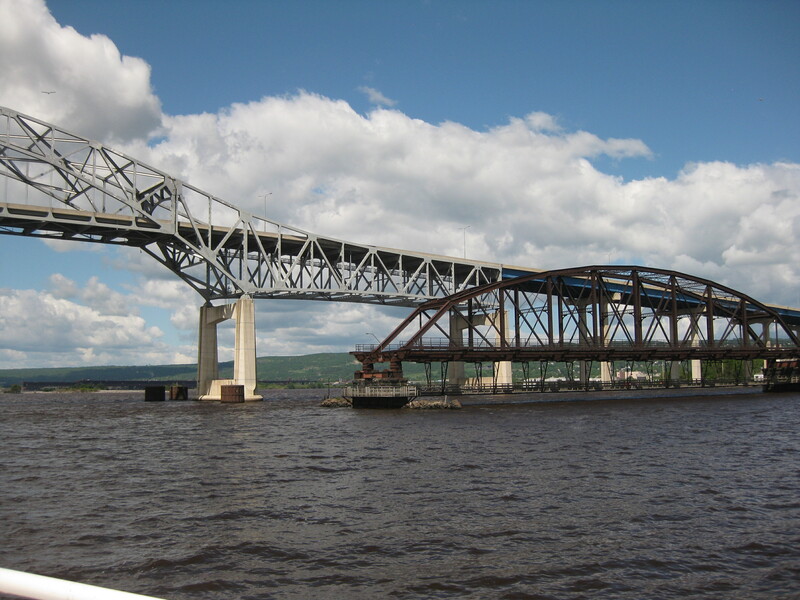 Now it serves as a useful connector, completing the three mile stretch between Beaver Bay and Silver Bay. 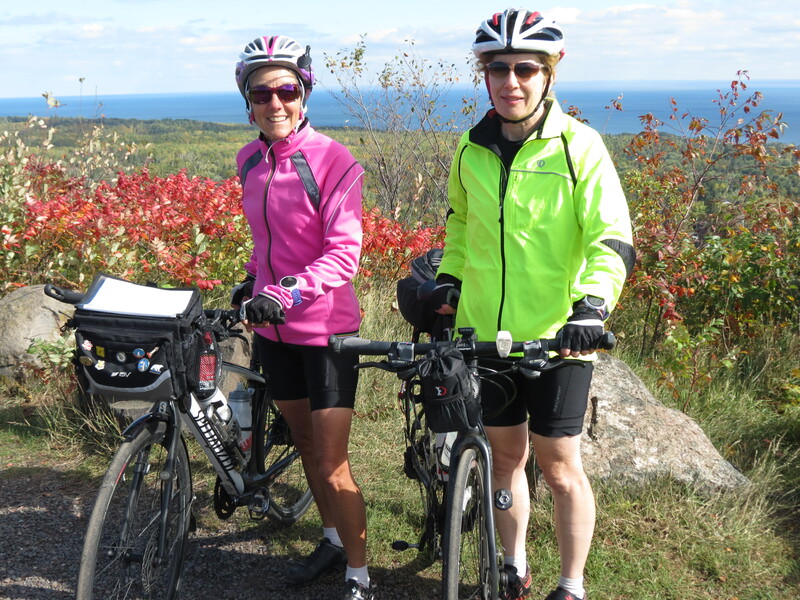 Since this day’s ride was a mere 32 miles, we chose to top it off with a hike to Gooseberry’s upper falls. Once again the recent rains were in evidence, filling the river with turbulent rapids and rendering the trail muddy and slippery. Progress was slow but enjoyable, even if we brought home much of the mud on our hiking shoes. If I wasn’t convinced before, our pleasant sunny bike rides contained ample evidence of the rainfall we avoided. For once, this ultra-planner is glad that she chose to abandon her plans and go with the flow. Cycling after the rain. 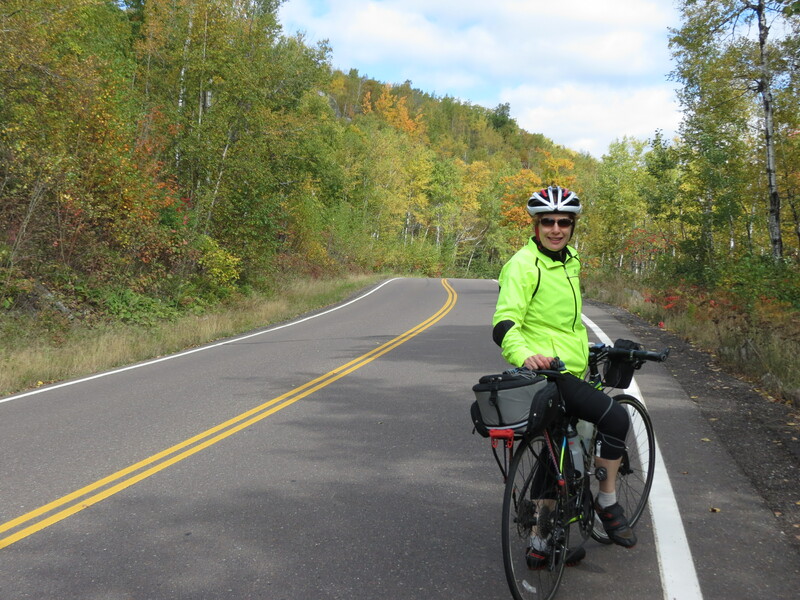 We met through a Google search using two terms, “Lake Superior” and “ferries.” The second result yielded my story in Bicycle Times about our Lake Superior Half-Tour using the Isle Royale ferries to cross the lake. From there it was an easy leap for Tony to find us on Warm Showers. If that all sounds a bit like gibberish, you are probably not a touring cyclist. But to those of us of that cult, it all makes perfect sense. In fact, it’s the epitome of traveling by bicycle – meeting great people in the most unexpected ways. 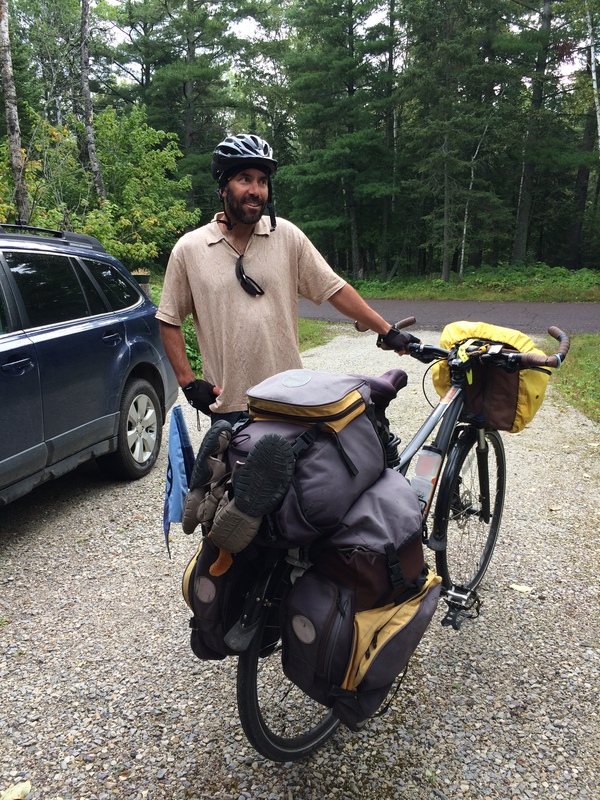 Tony is in midst of a cycling trip across the US. In the spirit of his easy going nature, he makes up his route as he goes, taking advantage of opportunities as they arise and dealing with what nature delivers. 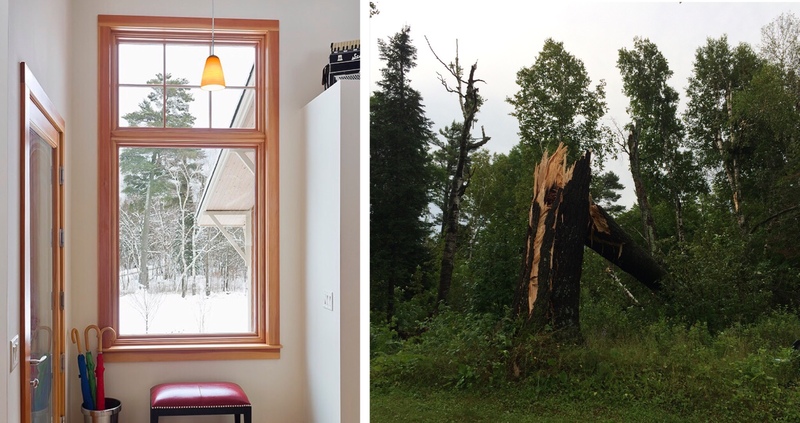 By the time he reached northern Minnesota, he had heard enough about the dangerous section of the Trans-Canada Highway above Lake Superior to know he wanted to avoid it. Hence his Google search. And my story. A quick check on the Warm Showers app confirmed his suspicion that we were indeed members – part of the cyclists who hosts cyclists network that exists world-wide. A few keystrokes later, it was all arranged. Tony would cycle 90 miles and stay with us the next night. 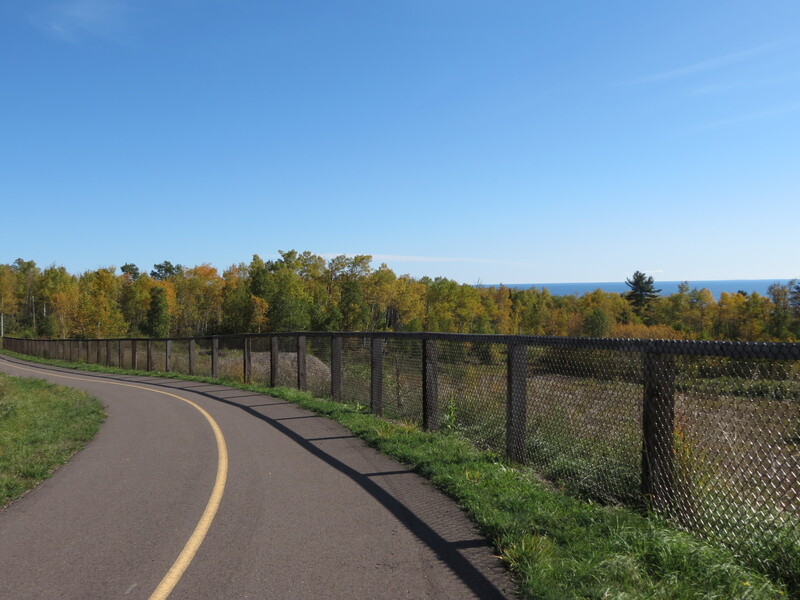 Living in Duluth, we are not on a heavily traveled cycle route, so we have cycling guests only a few times each summer. But the routine is always the same: Provide a bedroom, offer up shower and laundry facilities, serve a bountiful dinner to replenish their depleted calories, and engage in lively conversation about where our respective cycle tours have taken us. It never fails to be an entertaining evening. 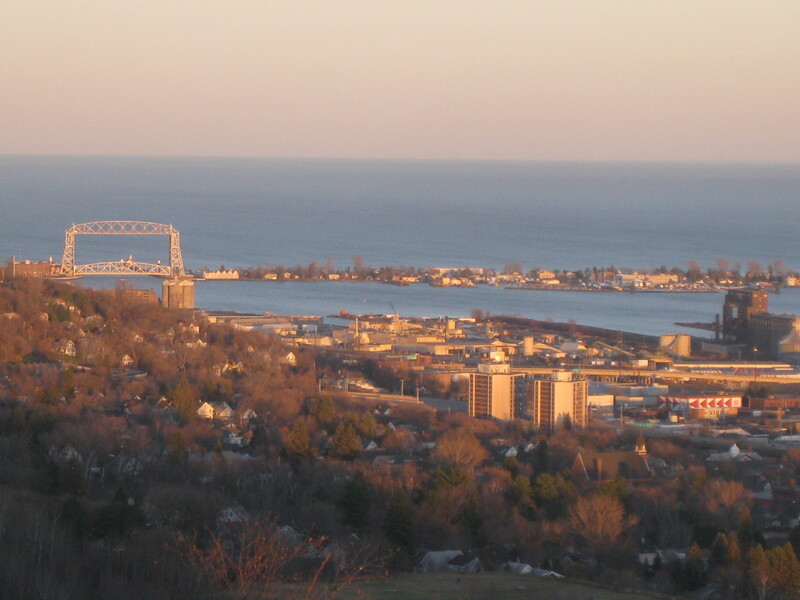 That night, Duluth provided a perfect summer twilight. Not only was it still warm, but the lake was unusually calm. Best of all, a boat was headed for the Aerial Bridge. We were able to give Tony the ultimate local experience. We sent Tony off with a big cyclist’s breakfast in the morning. But he didn’t get far. A broken spoke turned out to be evidence of more serious wheel damage, and replacement parts would not arrive until morning. Tony took it in stride, and we took Tony back in. Another evening of sharing, a walk along Amity Creek and good vibes of friendship ensued. It’s always a pleasure to welcome cyclists to our home. Countless others have done the same for us. No matter how we find each other. When the sun shines, you just gotta get out there and enjoy it. And when the temps are far warmer than they should be in November, there is no excuse for staying inside. So although I have not been out hiking around Duluth for ages, I’ve logged four straight days of blissful rambles through our local woods. I have to credit the weather for that. My first foray was down Congdon Creek and back with my sister, Susie. This was our backyard growing up. We’d play in the woods and follow the creek on a regular basis. I walked over the huge pipe every day going to Ordean Jr. High. (You could never do that now!) And yet, we were amazed by the beauty and extreme scenery that day as we meandered along the creek. It was flowing faster than could be expected for late fall, and the high rock canyons and waterfalls left us in awe as we crossed and recrossed the river on the new bridges. I followed that with the trails just below Hawk Ridge, with their outstanding views of Lakeside. I still can’t quite work out which streets are which from that height, but it doesn’t matter. The lake stretched out in the distance, and the sun brilliantly illuminated the entire scene. Even closer to home, I walked the Lester-Amity ski trails, delighting in seeing them now free of trees and ready for that first snowfall that signals the start of cross-country ski season. Those were just warm-ups compared with yesterday’s hike on the Superior Hiking Trail with friend, Beth. 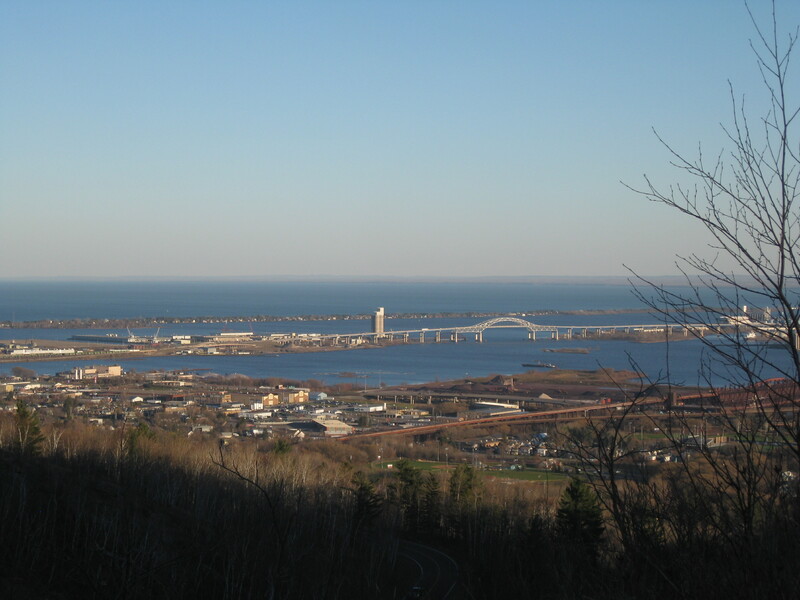 She took me on her favorite hike across West Duluth, which she calls the “greatest hits” for its wide array of natural scenery. 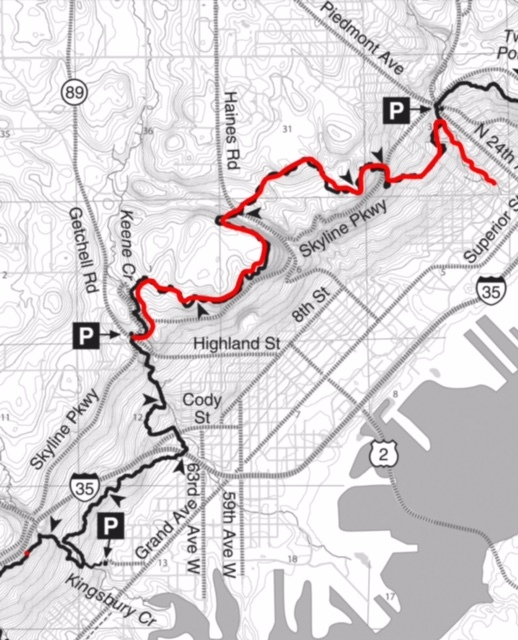 Starting from Highland and Skyline Parkway, we made our way on the Superior Hiking Trail across the ridges high above the St. Louis Bay to Lincoln Park. For six miles, we walked through beautiful woods, kicked up leaves, scrambled over rocks and embraced the fall scene surrounding us. Nature had retreated to its pre-winter state, brown and brittle with dry wispy remembrances of blooms past their glory days. Beautiful in its own way. Once up on the ridge line, there was more. Each opening of the trees brought stunning views of the city and shipping lanes below. It wasn’t hard to marvel over the beauty of the city where we live, and our good fortune in choosing it. We started late enough in the afternoon that sunset crept up on us mid-hike. The blue sky began to pale and the city glowed in the low angle of the sun. 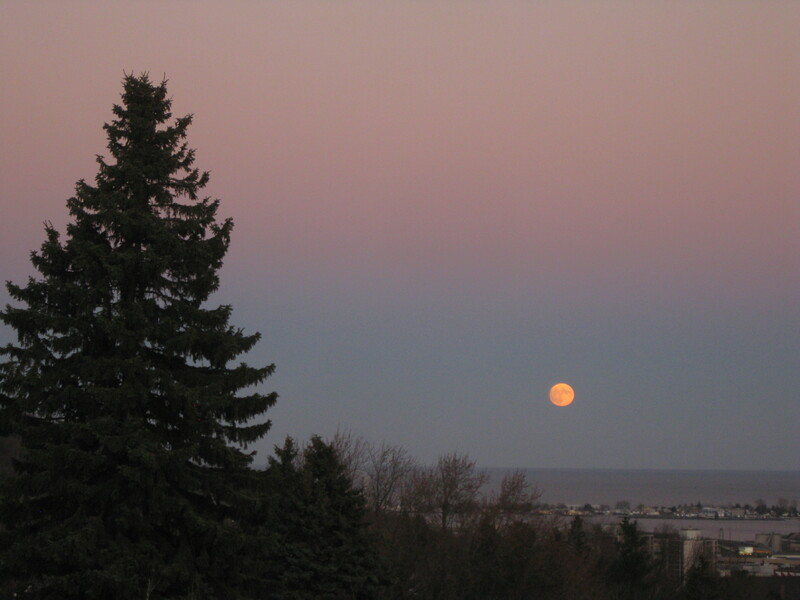 I was anxious to see the rise of the Super Moon, which is one of the reasons we chose this hike. We began searching for its debut, peering out over the lake at every opportunity. 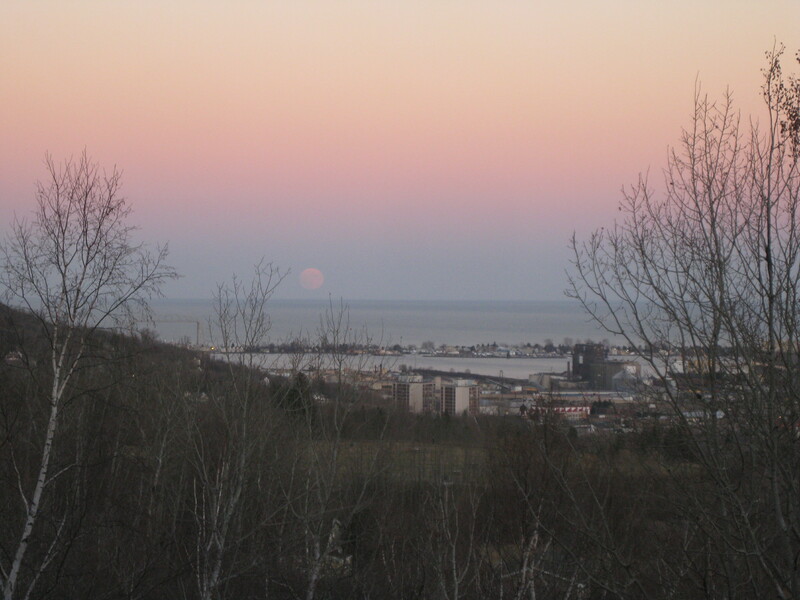 It was Beth who first spotted it, low and pink, still reflecting the colors of the sunset in the opposite direction. That part of the hike was magical. Every view of the moon was different. Framed by new scenery. Taking on more vivid colors. Peering out at us from its perch in the sky. I didn’t even care that my good camera and tripod were in the car. I preferred to see it all live, and snap the occasional haphazard picture with my pocket camera. All were great hikes. Restorative and soul enhancing. But that last bit was extra special. It’s not every day that you can hike with the Super Moon. We all have too many things. Kids especially do. So for our grandson’s 6th birthday we chose to give him an experience instead. 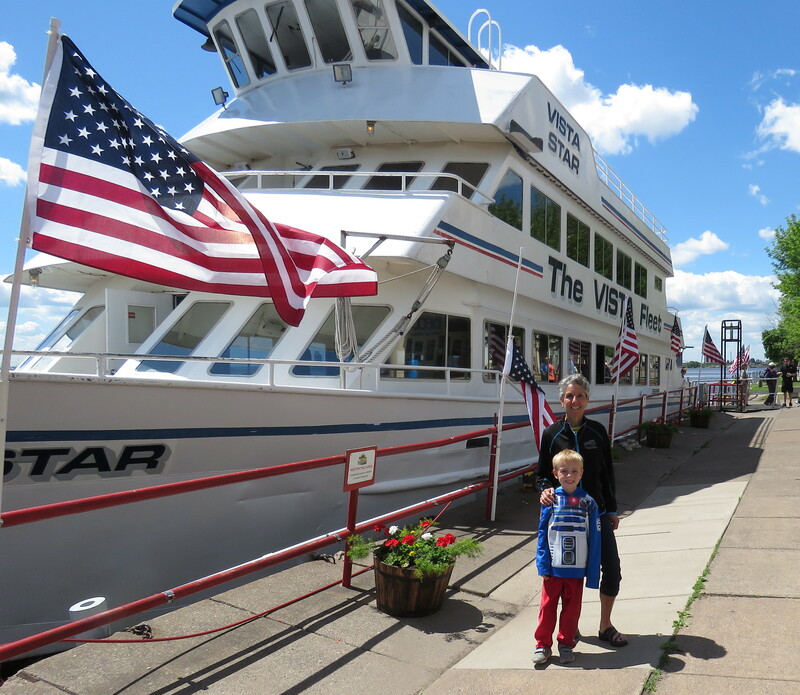 Leaving his siblings behind, we took just Ben on the Vista Star tour of the lake and harbor. For days, he looked forward to it. And I have to admit, so did I. There is something special about one-on-one time with a grandchild. I’d done the tour before. I’d heard most of the facts, figures and stories from the narrator before as well. But I saw and heard it all through fresh eyes that day. Everything becomes new when seen from a child’s point of view. 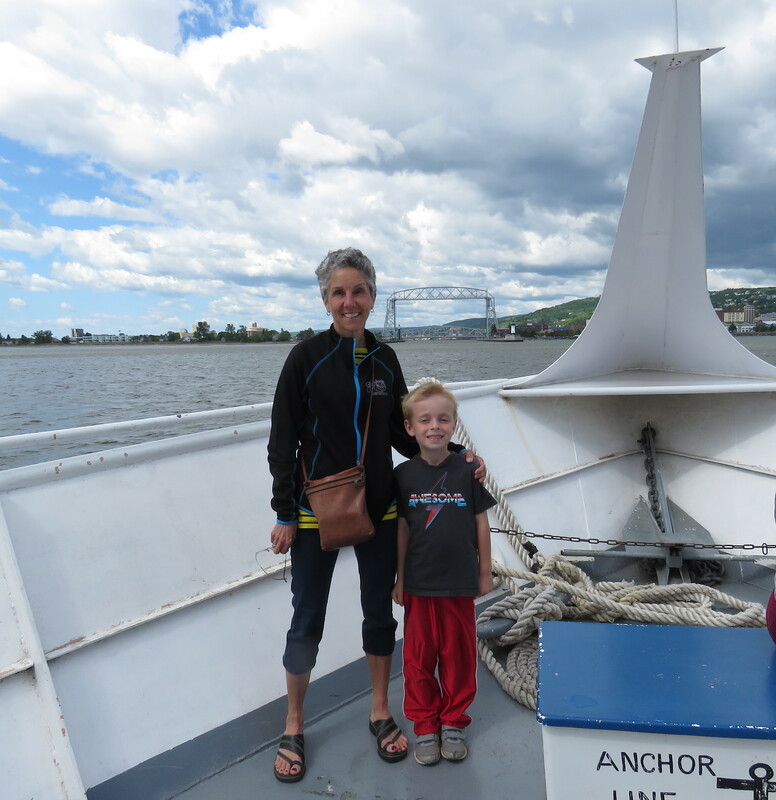 As always, the tour started with a jaunt out into Lake Superior. Before we could sail under the bridge we had to wait for a 1000-footer to enter the harbor. 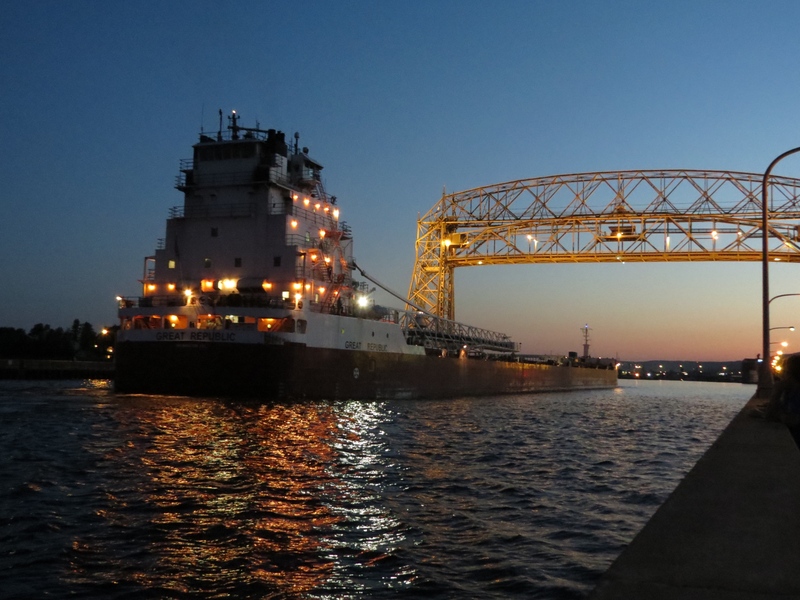 It felt like forever between the time we first saw the bow emerge until its stern finally passed by. 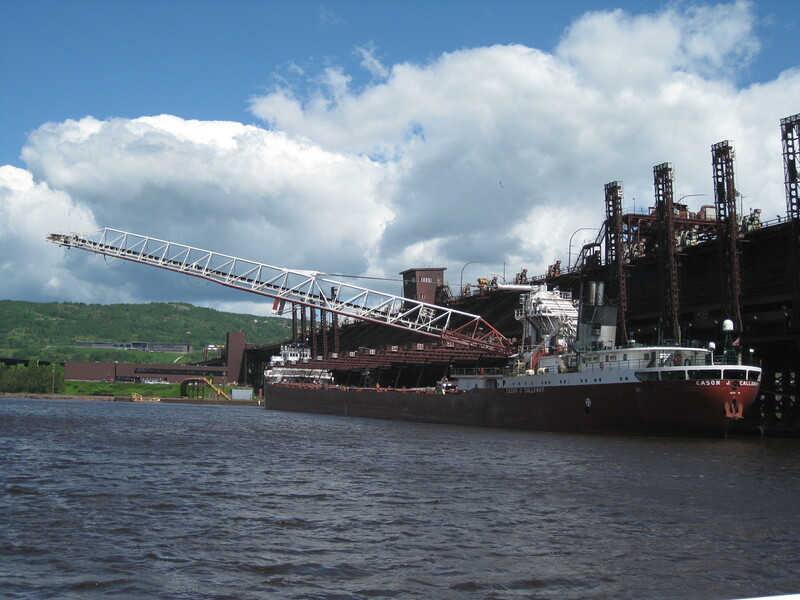 That was one long ore boat. Ben loves the Aerial Bridge. So we were mystified that he was anxious about going under it. The hands firmly planted over his ears and the fear in his eyes soon told us why. He knew exactly what was coming. 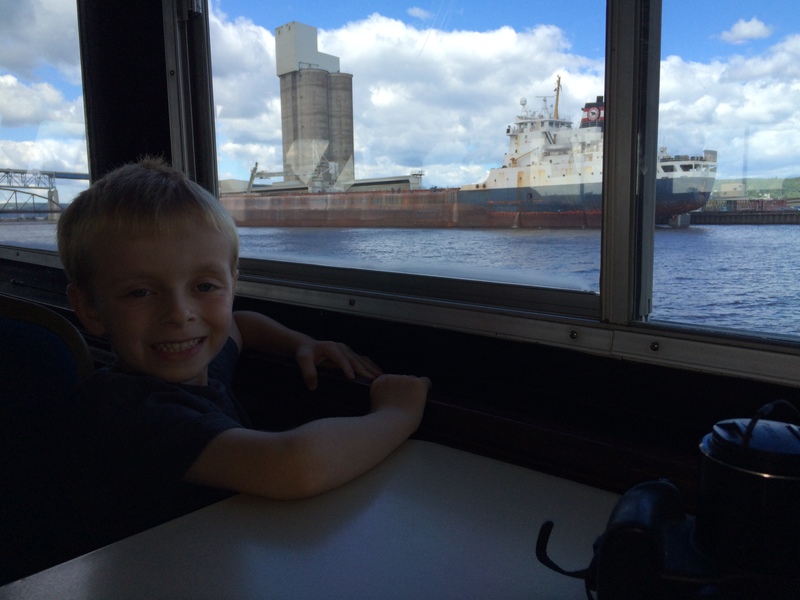 The boat’s loud horn and answering blast from the bridge were indeed ear numbing. But once we cleared the bridge, Ben could relax and enjoy the ride. 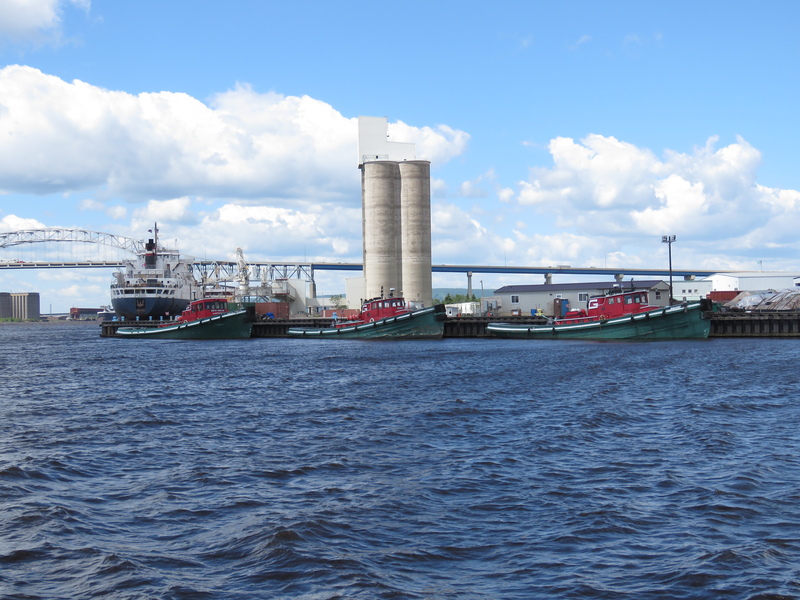 There was plenty of shipping activity that morning, from a ship offloading wind turbine parts to tug boats awaiting a call for help and a classic ore boat taking on its cargo below the ore dock. All of it of great interest. The Vista Star itself proved to be fascinating to Ben. There were so many places to explore, from the top deck to the bow and the “restaurant” inside. And the best part about grandparents is that they succumb to requests for treats. One never knows just what a little mind is taking in. Some of it we gleaned from Ben’s parents later. Apparently he regaled them with tales of his boat ride all the way home, proving that he did indeed listen to the narration and our explanations! One highlight was going under the Blatnik Bridge because “it was so cool to look up at it underneath.” I didn’t even think to look up. But I may have yet another chance. I hear that his little sister wants a turn next.